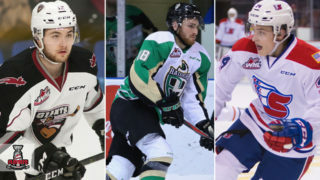 Fresh off being named both the WHL and CHL Player of the Week, Bowen Byram put together one heck of an encore. 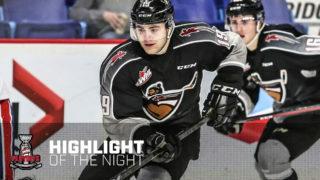 The 2019 NHL Draft prospect scored twice, including the overtime winner in a 5-4 road victory for the Vancouver Giants (27-12-2-0) over the Tri-City Americans (21-16-2-1). Davis Koch (1G, 2A), Jadon Joseph (2G, 1A) and Tristen Nielsen (2A) continued their strong play, combining for eight points while David Tendeck made 22 saves to earn the victory in goal. Kyle Olson had a goal and an assist in response for Tri-City. It was the Giants first win in Kennewick, WA since February, 2015. TC – Riley Sawchuk (13) opened the scoring at 7:22 of the first period off a two-on-one rush with Krystof Hrabik. TC – Sasha Mutala (11) extended Tri-City’s lead to 2-o when he converted off a Kyle Olson rebound at the 18:00 mark. 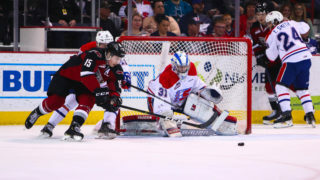 VAN – Jadon Joseph (14) got Vancouver on the board at 1:07 of the second period when he beat Tri-City netminder Beck Warm from in close. Davis Koch earned an assist. VAN – Davis Koch (11) finished off a feed from Jadon Joseph on a two-on-one at 11:35 to even the score at 2-2. 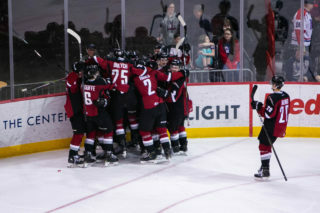 VAN – Exactly two minutes later Bowen Byram fired home his 14th of the season from the right-wing circle to give the Giants their first lead of the game. TC – One minute and 24 seconds later, Anaheim Ducks prospect Kyle Olson (!3) raced down the right wing and placed a perfect shot over the right shoulder of David Tendeck and in to even the score at 3-3. VAN – Jadon Joseph (15) potted his second of the game with 0.6 seconds remaining in the second period. Davis Koch and Tristen Nielsen both earned assists. TC – Parker AuCoin scored his 23td goal of the season on a penalty shot at 1:56 to get Tri-City back even at 4-4. VAN – Bowen Byram (15) ended the game at 2:39 of the extra period when he ripped a shot past the right shoulder of Beck Warm from the top of the left-wing circle. 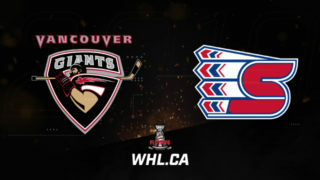 Next Giants Game: Friday night in Spokane against the Chiefs at 7:05 PM. Over the course of his current seven-game point streak, Bowen Byram has scored six goals and eight assists for 14 points. Over the course of his current four-game point streak, Davis Koch has registered three goals and eight assists for 11 points. He’s had three points in each of his past three games, and two assists in each of his past four games. Wednesday’s win in Kennewick marked the first time the Giants have won in the Tri-Cities since February 14, 2015. The Giants improved their overtime record to 2-2 and their road record to 10-7-1-0 thanks to Wednesday’s victory.